Toilet Twinning are a UK based water and sanitation charity that improve the lives of people across Africa and Asia. As an extremely popular charity, with a fiercely loyal supporter base, they've seen huge growth since starting in 2010. They have a unique approach to fundraising which, from an operational standpoint, places them somewhere between a conventional charitable donations model and e-commerce, meaning existing software workflows are hard for them to fit into. We were tasked with helping Toilet Twinning prepare for future growth, ensuring they had an effective website and were using the right technology to optimise their back office processes. We redesigned their supporter facing website, taking a supporter-focused approach to ensure that key donation journeys were optimised. We analysed their ordering and fulfilment process, including the operational workflow of back office staff and reporting needs of senior managers. We analysed current bottlenecks and common pain points for staff and proposed ways that a re-imagined system could make Toilet Twinning more efficient. Building on this we created a bespoke Back Office System to manage the day to day running of the organisation and seamlessly integrated it into their website. Aside from the core ‘twin’ product, supporters were asking for an easier way to donate fixed sums of money. Some, typically a group or organisation fundraising on behalf of a number of individuals, also wanted to have this donation easily ‘converted’ into mutliple twins. 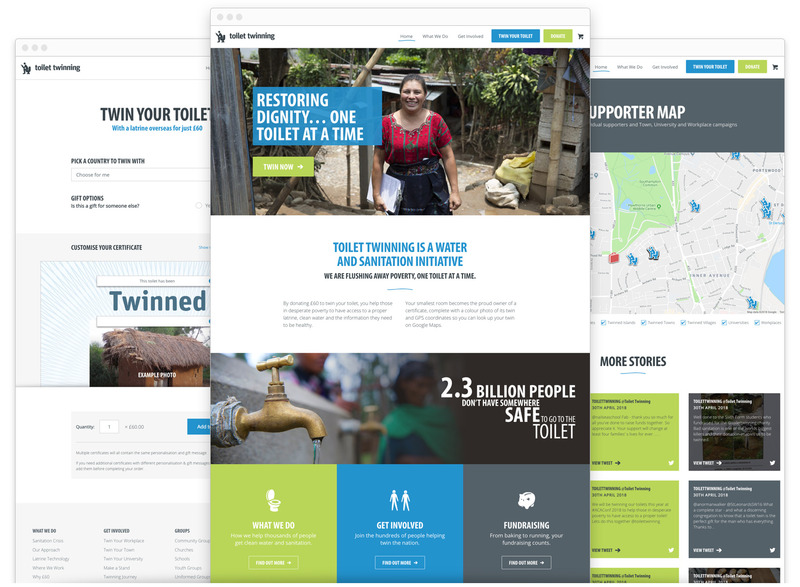 We designed a bespoke Donation page that enabled simple one off gifts but also a workflow for converting some or all of the donated values into Twinned Latrines. From day one of our client relationship with Rareloop, we knew that they understood the uniqueness of Toilet Twinning, and also some of the complexities that sat behind its simple proposition. Rareloop brought creative flair to Toilet Twinning’s ‘shop front’, which included a design refresh with new colours, and new graphics. We couldn’t be happier with the result and also with the collaborative process that led up to it. When we began work with Rareloop on our new website, we had had our existing website for more than six years, since the inception of Toilet Twinning. We knew our old site was limiting supporter engagement, and it was particularly hampering donations via mobile phones, as the order form was outdated and clunky. Since the launch of the new website, donations from mobile phones and tablets have soared. Navigation around the site is streamlined, and the use of icons, and graphics and story blocks have made it much easier for us to celebrate our supporters, and encourage more people to engage with Toilet Twinning – not just with twinning their toilet but also with fundraising, and ordering as a gift for friends and family. We love our new website. 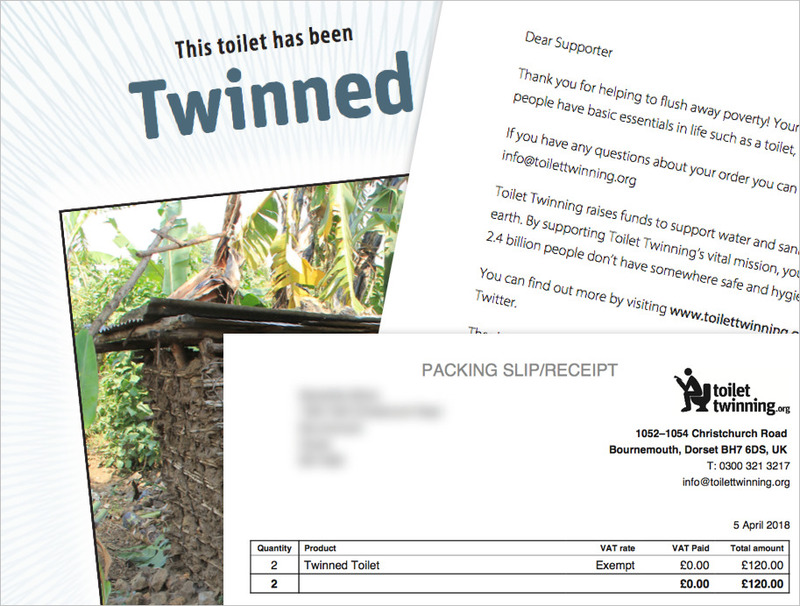 The fundraising offering for Toilet Twinning is unique and unlike a traditional charitable donation. We created a simple 3 step visualisation to simply communicate the ask from Toilet Twinning, the reward to the supporter and the impact to the wider world. We also used these 3 steps as a signposting interface to help supporters get more detail about each stage of the process. As part of the design we created a suite of bespoke icons that could be used both across the site and in additional offline media. Post launch, inbound supporter requests for ‘Make a Stand’ kits soared. This was a key target area for donation growth that Toilet Twinning had identified for the new site. With more orders fulfillable via the website and a clearer, more intuitive donation journey, Toilet Twinning saw back office telephone support time reduce. Real-time, accurate Gift Aid reporting on all donations dramatically reduced the time accounting staff spent on administrative tasks each month. The new site allowed for more complicated orders and flexibility of payment methods, especially around donations. This enabled more supporters to give the way they wanted, resulting in overall donation growth. The legacy system was unable to handle peak periods of high order volumes which would cause back office staff issues with fulfilment. The new system relieved this bottleneck, enabling Toilet Twinning to confidently grow their busiest periods without fear of technological barriers. We helped Toilet Twinning identify process bottlenecks in their back office system and created a bespoke platform from which they could create complex custom orders, process and fulfill existing orders and produce detailed financial reports. A dashboard was created that provided at a glance details of revenue that updates in real time. Values shown are for demonstration purposes only and not representative of real data. We built a bespoke system around the back office teams' tailored fulfilment process. Orders raised on the website are easily reviewed and processed from within the UI. The interface also allowed complex orders, not possible via the website, to be created by the team. We created a powerful reporting interface that enabled different teams within the organisation to answer the key target questions. e.g. “how many twins have been done by individuals as a result of Facebook?”. As well as an in browser view, all reports can be exported to a CSV for futher analysis. We also built a standalone Gift Aid report to reduce the regular overhead of collating this information. The Twin Certificate, packing sheet, labels and all accompanying information are automatically generated from each order in an overnight batching process. Each batch can then easily be sent to print reducing the time and cost associated with fulfilling each individual order. From the original briefing, through to the build and testing, we always felt that Rareloop had a real handle on what we were trying to achieve and came with creative solutions to our problems. They were also able to make suggestions for improvements that hadn’t occurred to us and we’ve really seen this impact to our daily workflow and output levels. Now we have our new Back Office System (BOS) we can perform a number of tasks that were previously either impossible, or at best, very time consuming. 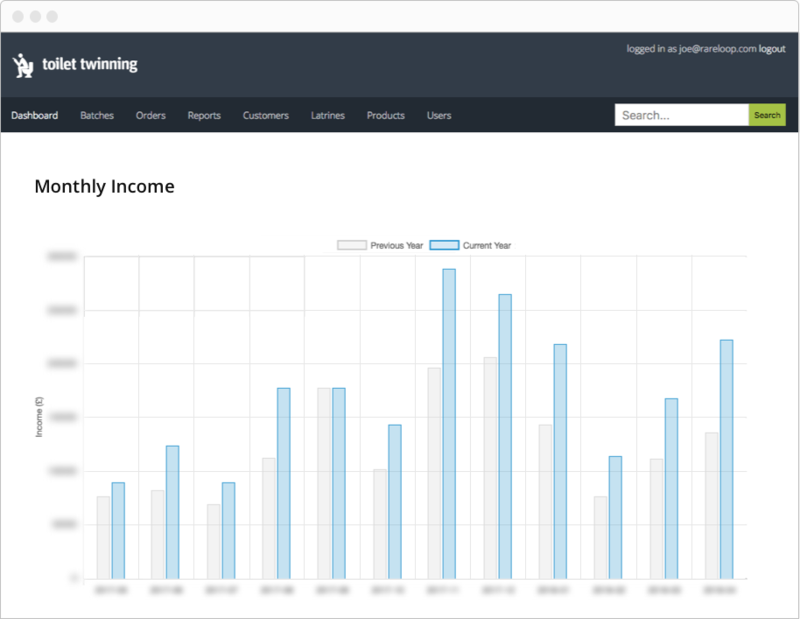 At a glance, we can now see how we are doing against our financial targets, and can break this down to specific product lines, marketing tactics, regions etc. We also have a much greater capacity for getting a large bulk of orders printed, and have the ability to do this flexibly. If a supporter wants an order to be sent on the same day, we can make this happen rather than having to wait for this to come through an automated download system. 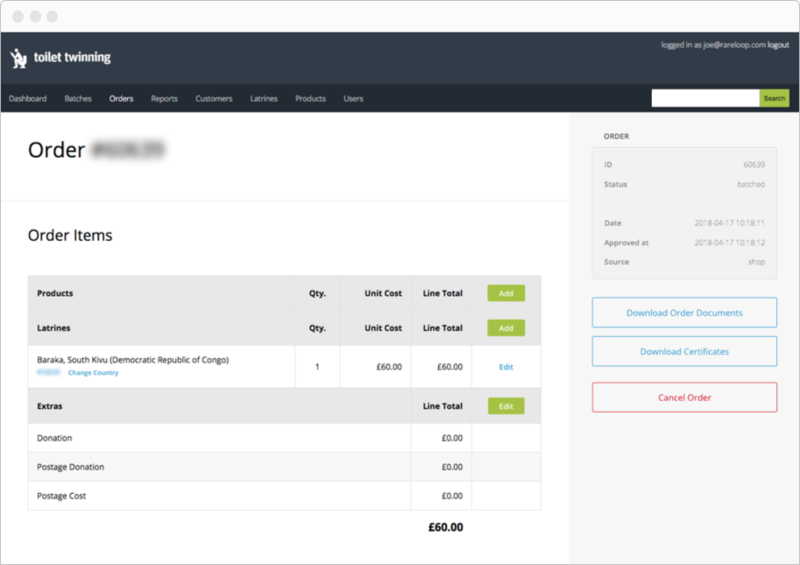 We can also amend and reprint orders really easily, making us much more responsive to supporter requirements. Stock control is hugely improved and financial reports, such as Gift Aid, are also now easier to administrate.